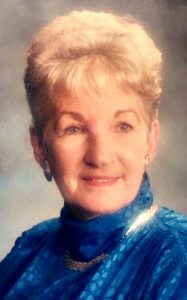 Joan R. (Bailey) McKinnon – of Lowell, formerly of Woburn, died peacefully April 2, 2019 at Lowell General Hospital, at eighty-seven years of age, with her family by her side. She was the beloved wife of the late Frederick J. “Fred” McKinnon. Born in Cambridge, Joan was the twin-daughter of Howard and Eileen (Timbers) Baily. She was educated in Belmont and a graduate of Belmont High School. In 1951 Joan married her childhood sweetheart, Fred, and they were married for sixty-two years. They moved to Woburn in 1960, where they raised their family. Joan recently moved in with her son John in Lowell. For many years, Joan worked for a metal plating company, L. A. Donovan Co.
Joan enjoyed spending summer vacations on the Cape with her family. More recently, she enjoyed walking in the Burlington Mall daily and found a community of friends there. she had a unique sense of style, never leaving the house without a brooch. She also enjoyed reading, solving word puzzles, and loved pink roses. In addition to her parent’s and husband Fred, Joan was predeceased by her daughter, Eileen M. McKinnon. She is survived by her children, Frederick W. McKinnon and his late wife Mary of NH, John E. McKinnon, his partner John Bellavance of Lowell, and the late Eileen M. McKinnon. Cherished twin sister of Jean Hartford of FL. Our deepest condolences, your mother was a lovely lady.